Extremely condensed titling fonts are useful for situations where you want the reader to slow down while packing a lot of letters into a narrow space. That’s exactly what Droid is all about. 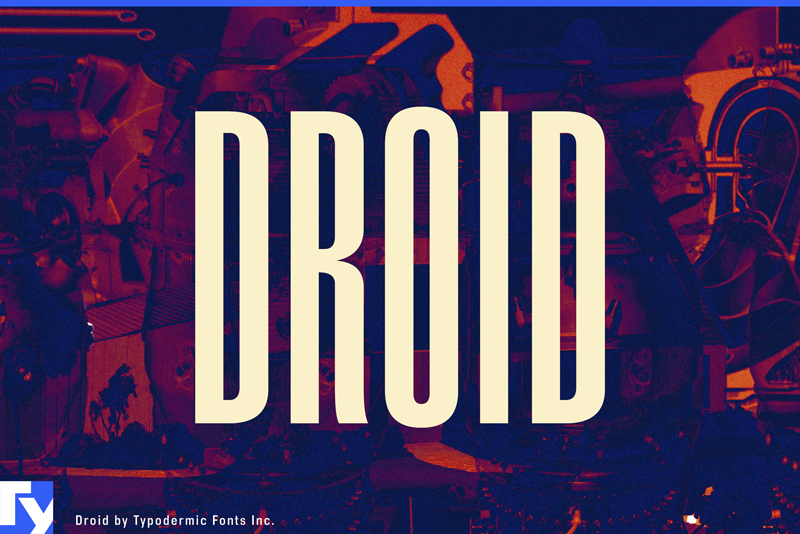 Droid is what’s called a unicase font. Unicase fonts are sometimes referred to as bicameral or mixed-case—a blend of capital and lowercase forms, all set to the same height. When Droid was created in 1996, unicase fonts had just come back in style. In the late 1960’s and early 1970’s, there was a lot of unicase type going around, but it fell out of fashion abruptly. There was a span of about 15 years where unicase fonts were rarely seen. Just like 1960’s clothing, unicase fonts have been through the fashion cycle so many times that they’re no longer subject to seasonal change. Even though Droid was meant for headlines and logos, it comes with standard math symbols and fractions. Droid supports most European languages and even contains a Cyrillic character set. For a stark, picket fence effect, try setting the spacing really wide.